Device Magic users can now revert their forms back to a previously saved version. This is useful for anyone who doesn't want to manually add/remove any changes to their form to match a previous version. In this article, we'll provide a walkthrough of this feature. 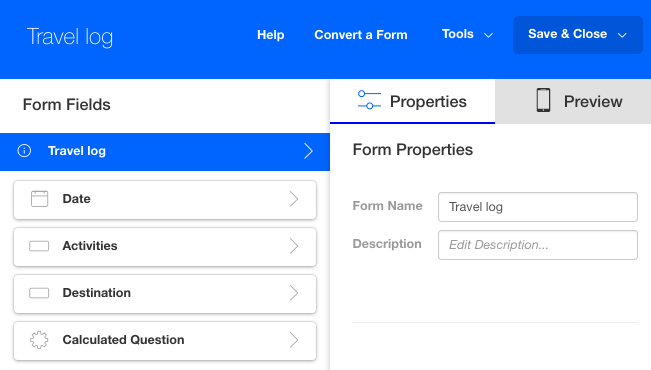 First, open your form within the form builder. In the example, I simply added an 'Image question' to the latest version of the form and saved. In order to revert back to a previous version of the form, all you have to do is hover over the 'Tools' button in the top right corner and click 'Revert Version'. The 'Revert Version' dropdown will appear where you can select the version of the form in which you'd like to revert back to. I selected version '1.00' which doesn't include the 'Image Question'. After selecting the version, click 'Revert Version'. The form will then change back to its previous state. As you can see below, this version doesn't contain the 'Image Question' from the newer version. Lastly, after making any additional changes (if any), click the 'Save & Close' button. This concludes our overview of our revert tool. If you have any questions or comments please contact us at support@devicemagic.com or leave us a comment below.